May 16, 2011  One of Emanuel's biggest challenges will be to be put his stamp on governing the "city that works" without suggesting that his friend, the former mayor, left the city in something of a mess which, according to some critics, he did. February 22, 2011  Emanuel avoided a runoff by winning 55 percent of the vote. The victory caps a campaign that included a failed legal bid to try to keep the former White House chief of staff off the ballot. February 22, 2011  The question in most people's minds is not whether Rahm Emanuel will win today's Chicago mayoral election. It's whether or not he can get the 50 percent to avoid an April runoff. January 28, 2011  With the Illinois Supreme Court ruling that Rahm Emanuel has satisfied city residency laws, the major candidates for mayor of Chicago debated Thursday, just weeks ahead of the Feb. 22 election. 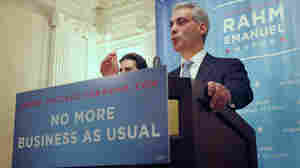 January 27, 2011  Rahm Emanuel will be on the February 22 ballot that decides who will be the next mayor of Chicago. The King's Speech; Also, Is Rahm-bo A No Go In Chicago? 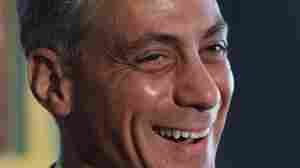 January 25, 2011  In Political Junkie: Previewing Obama's State of the Union address, a new wrinkle in Rahm Emanuel's plan to be the next mayor of Chicago. Plus: winners are named in the 2010 election contest! January 25, 2011  The Chicago board elections has been told not to print ballots for the city's mayoral election without Rahm Emanuel's name on them. January 24, 2011  He's expected to appeal the decision to the state's Supreme Court. At issue: whether he was a Chicago resident while working as chief of staff at the White House. 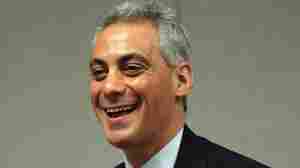 January 4, 2011  A Cook County judge agreed that Emanuel has Chicago residency despite working in DC for Obama. Meanwhile, Emanuel provided some clues about how he would raise money for the city's budget. Think garbage trucks. December 23, 2010  The issue -- his residency -- could still wind up being decided by the courts, however. 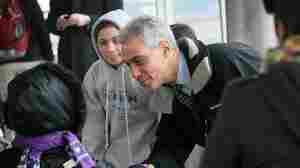 December 23, 2010  Emanuel's eligibility for mayor was contested by some who said he didn't meet the residency test. A hearing officer cast aside those challenges, saying that Emanuel didn't abandon his Chicago residency when he moved to Washington to work for Obama. November 2, 2010  What are we going to call this historic loss by the Democrats? The 2006 GOP loss was "the thumpin' " which became the title of a book about how Rahm Emanuel led Democrats to their now lost majority. October 1, 2010  Live blog of President Obama's announcement that Rahm Emanuel is leaving his job as White House chief of staff to run for Chicago mayor and that Pete Rouse, a senior aide, will be his successor, at least temporarily. President Obama's Peter Rouse: Who Is He? October 1, 2010  Peter Rouse, a senior advisor to President Barack Obama and a long-time Washington insider, worked for nearly two decades for Sen. Tom Daschle before becoming Obama's chief of staff and guiding the young senator's course.